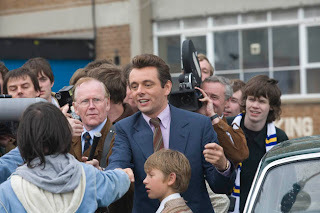 Screenwriter Peter Morgan adapts David Peace’s novelized account of legendary, enigmatic English soccer manager Brian Clough (Michael Sheen) and his 44-day, ill-fated stint as head of reigning champion Leeds United in 1974. However, perhaps less than five minutes of game-play is depicted throughout the film, much of it snitched-in snippets of archival footage. The audience learns the outcome of matches only by their scores being printed across the bottom of the screen. Indeed, for a pivotal match between Clough’s previous team, Derby County, and rival Leeds, then led by iconic manager Don Revie (Colm Meaney), the camera remains strictly with Clough inside Derby’s locker room, with only crowd’s reaction available to divine the result of a match Clough is too nervous to actually watch. Likewise, unlike the usual sports film that follows a story arc of adversity, perseverance, and triumph, success turns into failure in Damned United. Scenes of Clough’s heralded arrival as Leeds’ manager – after Revie departs to lead England’s national team – are interspersed with his earlier achievements with Derby County from 1967-1973, during which he took the Rams from the bottom of England’s Second Division to champions of Division One. However, Clough’s abrasive personality and outsized ego ultimately bring about his downfall in both Derby and Leeds, as well as the deterioration of his relationship with longtime assistant Peter Taylor (Timothy Spall). From a purely sporting viewpoint, the enmity between Clough and Revie is emblematic of English football’s modernization during the late 20th century. The soccer depicted in Damned United hardly resembles “the beautiful game,” but instead a muddy, bloody, sometimes brutish sport viewed by unruly spectators in dilapidated stadia. These conditions would eventually lead to English football’s decline and the rise of hooliganism during the late 1970s and 1980s, banishment from international play on the Continent. The reform movement that that followed included the Football Spectators Act of 1989 and, in 1992, the top 22 clubs formed the Premier League. Accordingly, Clough lambasts Revie and Leeds for their violent play and gamesmanship – “cheating” he pointedly labels it – while advocating a game grounded more on finesse and sportsmanship. Prior to Leeds’ first visit to play Derby in 1967, Clough – then an ardent admirer of Revie – scampers about trying to dress up his shabby facilities; he futilely implores his groundskeeper to make the pitch “look like carpet” and the cleaning staff to put a spit-shine on dingy latrines. Still, this historical backdrop is mere window-dressing for The Damned United’s two primary tableaux. First, it is a character study of the corrosive effects of pride and obsession, embodied in Sheen’s magnificent performance. The seed for Clough’s Ahab-like fixation on besting Revie and, by extension, Leeds is planted during that 1967 visit to Derby, when Revie neglects to even introduce himself to Clough. This slight, intentional or not, sparks a competitive fire that would both motivate and consume Clough, culminating with a Shakespearean fall from glory. Moreover, at its core, The Damned United is a (platonic) love story. The friendship between Clough and Taylor, who served as Clough’s brilliant talent scout, has the emotional ebb and flow of a marriage, and neither party functions professionally as well apart as well as they do together. It is telling that the only measure of onscreen redemption Clough enjoys is a reunification with Taylor (Clough’s later, even more legendary exploits at Nottingham Forest are only referenced during the film’s epilogue). “I’m nothing without you; please, please, baby, take me back,” incants Clough– on his knees, no less – before Hunter will consider any reconciliation. Director Tom Hooper (HBO’s John Adams) totally engrosses the viewer within the film’s opening 10 minutes with two monologues by Clough that exhibit his genius, hubris, and susceptibility to self-sabotage. Sheen’s delivery and the way Hooper frames the actor’s maniacal, Cheshire Cat grin bear a fitting resemblance to close-ups of Malcolm McDowell’s Alex early in A Clockwork Orange. Sheen has now superbly and revealingly portrayed three modern British icons: Prime Minister Tony Blair, David Frost, and now Brian Clough. He should have received an Oscar nomination for his portrayal of Blair in The Queen; he deserves to win one for his spectacular, mesmerizing performance here. Several of Morgan’s recurrent narrative devices are again on display, including pivotal phone calls between lead characters (a la The Last King of Scotland, The Queen, and Frost/Nixon) and climactic television broadcasts (Elizabeth II mourning Diana; David Frost interrogating Richard Nixon). Here, a televised joint appearance by Clough and Revie on the occasion of Clough’s sacking by Leeds not only brings the two adversaries face-to-face but brightly illuminates Clough’s destructive mania. When Clough caps his list of grievances by recounting the precise date, seven years prior, when Revie refused to shake his hand, the reaction of Revie and others on-set is not unlike looks of shocked pity Captain Queeg and his steel balls receive during the Caine Mutiny court-martial. The Damned United is an underdog story, but not strictly in the traditional sense of the also-ran that achieves unlikely greatness. It is also about someone whose success blossoms only on fields barren of expectations. Michael Clough is the underdog who didn’t know what to do with the car once he caught it.